Location, location, location - the house is located in the beautiful upscale neighborhood in Jacó Beach. This pristine Italian built custom home is situated in prestigious Jacó Beach. Conveniently located in the middle of the best two worlds: beach & lush mountains. Turn right and walk a few minutes to the warm water and sandy beaches. This spacious and bright home has 2 master bedrooms and 3 baths. 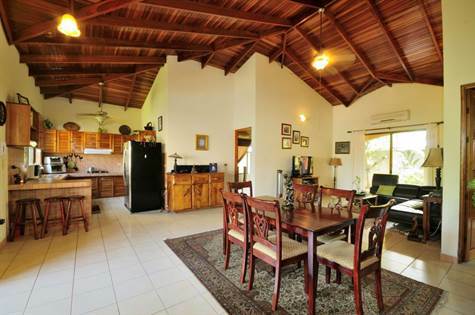 When you walk in the door you are greeted with teak high ceilings with Spanish tile throughout. The oversized master suites are complemented by wall to wall custom built-in teak closets. Large kitchen with custom built teak cabinets designed for a family sitting with a breakfast bar. Spacious grounds with beautiful swimming pool and outside shower. There is a separate laundry room with a sink and washer machine. Other features are A/C and ceiling fans in each room, solar water heater throughout, teak vaulted ceilings throughout, wrap-around patio, quiet street, incredible value, and much more neutral décor. Vacation home or live in year around. Plenty of storage with two large sheds. Rain gutters all around the house. Conveniently close to restaurants and shopping. Shows terrific, clean bright open floor plan, must come & see!